Amazon – A Monopoly That Must Be Stopped? In case you haven’t noticed, Amazon sells a lot of books. Make that a LOT of books. Some estimates say we’re getting close to the day that more than 50% of all publishers sales will go through this channel. But isn’t this starting to resemble a monopoly? So much power concentrated in the hands of one company is what our government is supposed to prevent, right? Some people certainly have this opinion but at Speaking of Wealth, we see it from a different angle. Amazon is actually good for competition. There are several reasons behind our view but first let’s look at the definition of the word “monopoly.” One dictionary defines it as “the exclusive possession or control of the supply or of trade in a commodity or service.” Hmm. Amazon’s status in the marketplace doesn’t seem to support a claim of monopoly. While it supplies the broadest platform in the world for publishers of all sizes to sell their books, there is nothing about the arrangement suggesting exclusive possession or control. Amazon’s share of the ebook market has dropped from 90% a few years ago to around 65% today. What CEO Jeff Bezos and company have done is show the rest of world that the ebook/POD model can be profitable. Amazon blazed the trail that others like Barnes & Noble, Google, Kobo, and Apple decided to follow. Seems to us like Amazon actually fosters competition. It used to be that large publishers virtually had the bookstore market locked up. 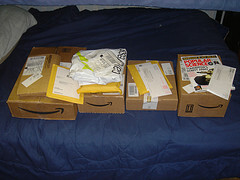 Amazon’s friendliness towards small and independent publishers has allowed enterprising authors to step in and sell hundreds of thousands of copies of digital and self-published books completely outside the old system. Once again, good for competition. Writers have more choices than at any time in publishing history. In the past five years, advances have plummeted, contract terms have gotten way more restrictive, plus the royalty rates paid by traditional publishers have always been laughable. Mainstream publishing houses pay about 8% to 12% royalties, while Amazon pays a full 70% AND allows the author to set the price. And let’s not even talk about the glacial pace at which the publishing industry gets a book to market. Expect to wait months if not years. Got an ebook? You could have it for sale on Amazon today, earning you money. Through their imprint CreateSpace, you can have a POD paperback or hardcover version ready to ship within a few days or a week at most. Amazon’s no monopoly. It’s putting the power of publishing into the hands of writers for the first time ever.